Warning: The following story is so damn heartwarming it may melt your computer or mobile device. A 10-year-old boy with Down syndrome reported missing in Hackleburg, Ala., on Tuesday was found on Wednesday morning along a creek near his home with a pair of puppies that rescue workers believe kept him warm overnight. The boy, Kyle Camp, went missing Tuesday afternoon, his family said. Police, firefighters and as many as 150 volunteers launched an air-and-ground search that lasted well into the night, covering several square miles, Marion County Sheriff's Dept. officials said, and resumed early Wednesday morning. Jamie Swinney, one of the volunteers, told WAFF-TV that he followed the Camp family's dog along the creek and discovered the boy in thick with the dog's two puppies at about 9:30 a.m. Wednesday. "I heard the dogs barking again and followed him down there and started hollering for the puppies and I hollered for him and he hollered back," Swinney said. "He was in the creek about a half a mile over the ridge." 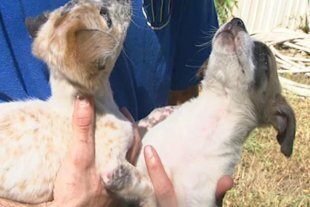 According to WAFF, the boy was found wet and without shoes, and officials "think the puppies kept him warm overnight." The boy was treated for minor injuries at a local hospital and was released. According to WAFF, the boy was found wet and without shoes, and his tongue covered in puppy hair. Ten years of trying to get rid of this bucket head and foiled again by those bumbling puppies!